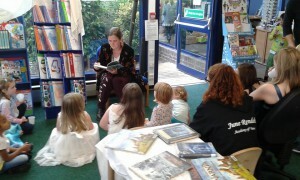 Storytelling at Coppice Library’s Narnia event, with an attentive audience. …but most people call me Carol Ferro. I tell stories to young and old alike, specialising in oral storytelling aimed at young children, and I am a member of the Society for Storytellers . Qualified and experienced in early years learning with a BA in Early Years care and Education, I have been delighting children with my stories for several years, and regularly post examples of my short stories on my Social Media feeds. I am a published author, you can find out more about where to get hold of my delightful works on my books page. I have formatted several books for publication as both ebooks and paperbacks, and am happy to discuss your formatting requirements. You can purchase my framed personalised stories, Framed fairytales, or framed “Short Story Lady” originals. All are bespoke pieces of art and literature, written to individual requirements, perfect for birthdays, baptisms, weddings and other occasions. I offer storytelling sessions at schools, nurseries and libraries throughout Trafford, Contact me for more details or to book me for a session at your setting. I am enhanced DBS checked, have PLI of £10 Million, and can provide references on demand. I do storytelling and work with children and young people at St. Mary’s Ashton on Mersey , please check my Storytelling Ministry page for further details. I also offer children’s party packages, ranging from 30 minute storytelling to a full 2-hour party with craft and party bags. I can even provide a framed personalized short story for the birthday child to keep as a memento. See my parties page for more details, to check availability, or to book a party.